I remember it clearly today. I was walking down the hallway of my junior high school, and was one of the few kids who weren't wearing a new fad called Curves pants. Looking back on it now, they were the height of ridiculous 80's fashion: plaid brightly colored baggy pants that might as well have been pajamas. But what really mattered was that logo of a "slippery-when-wet" traffic sign. They showed that you were wearing authentic Curves. I begged my mom for them, she said no, they looked "stupid." They cost a ton of money and Kmart pants were perfectly fine. Kmart pants shouted to all the other kids that I was dirt poor. I hated them, and constantly wished I had Curves. I blamed all my problems on this: my nerdiness, the lack of any cool friends, and my complete and utter failure with girls. If only I had those sweet bright plaid pajama pants I would be cool! Today, I am much older and wiser. OK not really, but I like to think back on those days and shake my head and chuckle about how naive I was. Today I know that its not about what you wear, how much you make, what car you drive, at least not with anyone that matters. Or do I? I like to think I have grown beyond all those childish selfish thoughts about what is important in life. I have grown into myself. I have started to discover the true secret of happiness, that timeless wisdom of being a good man for its own sake. But, why do I constantly try to find clothes that I think will make me look cool? Why do I still worry about the shoes I wear? Why do I find myself dwelling on an off-hand remark from a friend that my car looks gay, or my hair is too long or too short or my skin too pale or my nose too big? The sad truth is this: I have not really outgrown that shallow selfish little kid who constantly worried about his status. After 20 years, I have only managed to push him just slightly out of my consciousness, to stuff him in a sock drawer, where he constantly calls out to me with a muffled voice. When you are a child, parents and teachers constantly tell you to Be Yourself! At the time, you aren't even sure what that means. How can you NOT be yourself? You are you, aren't you? It is only when you are much older does that seemingly simply advice sink in and become something so profound that even as a full-grown man it is difficult to completely grasp. It was something taught by the Hindi gurus thousands of years ago, by the great Buddha, and in its own way by Jesus himself. Gandhi knew it, King lived it. Kierkegaard fervently preached us to wake up and see it, Nietzsche warned us all to that if we failed to grasp its meaning, our lives would be wasted. And it is simple, once it finally hatches, like an egg. Be Yourself really means to Break Free. Break free from those bonds of the routine life, the idea that success and happiness is brought only by material wealth and status. Break free from the idea that you must look to the external world for direction, break free from the idea that your worth is something that can be granted like a lump of butter from others. As Locke recognized, your value is intrinsic, because you are a human being. The virtue of your human mind, its wonderful ability to do and to think and create anything that can be imagined, the hands that can build, these are the things that give you value. They are your potential to change your life and the world around you. Be Yourself, that simple phrase, is a call to stop looking outside for your path. You must turn inward and ask the most important questions in life: "Who Am I?" "Why Am I Here?" "What is the Right Way for Me to Live?" "So, um, Krishna, I kinda knew it was you. I mean, blue skin dude!" It sounds so easy, but the reality is the opposite. Its not easy. In fact, it is a constant struggle, a war that must be fought every day of your life. The Bhagavad Gita, that beautiful Hindu epic which inspired Ghandi to drop everything, to live only in selfless service to his people and country, is dedicated to this very fight. Arjuna, who is about to lead an army into battle, is in despair. Arjuna feels the battle is pointless and will lead to nothing good. 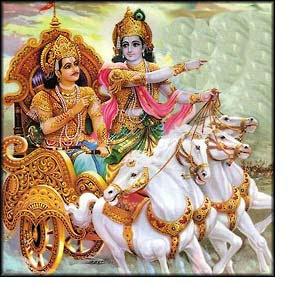 His charioteer turns out to be Lord Krishna, an incarnation of the supreme god Vishnu. The entire book is an exhortation of Lord Krishna to Arjuna to fight that battle, because the battle is really a metaphor for the battle within. That battle every person in the world fights, the war between selfish desire and true path. The body, its senses which seek temporary pleasure, constantly blinds oneself to one's true nature. And that true nature is the Self, that deep spark buried inside everyone that is a piece of the Divine. Selfish passions lead to a day when a person awakes at the end of a life to find it wasted and meaningless. The true path to happiness is the life of love and selfless action.